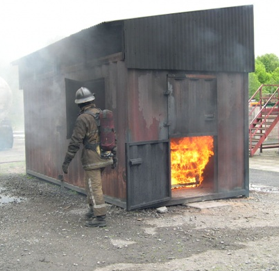 Backdraft Prop - The "Window"
Traditionally referred to as the "Window", this training propl is constructed from a 20' (6.5 metre) shipping container. The purpose is to provide a visual demonstration of the fire stages leading to flashover and backdraft. By altering the air flow via 2 stable doors and one hinged window, the instructor can provide a large scale demonstration of the fire behaviour indicators that are present before flashover and backdraft. It also provides an opportunity to demonstrate hoseline techniques that can be used reduce the liklihood or severity of these events. This demonstration is facilitated by an instructor outside of the cell who manipulates the ventilation profile to produce the desired conditions. The students are located a safe distance from the unit in a posituion that allows them to safely witness the "pre-indicators" of flashover and backdraft. Because this demonstration does not require the students to enter the hazard zone, a wide range of students can beneift. This includes firefighters, fire engineers, building designers, industrial fire teams etc.